If you walked into any Hardware hackathon over the last year, you would see they are about innovation and bringing new ideas to this world and most of them are centered around the connected devices nowadays. However, just walk the floor, talk to the teams and you can quickly see an elephant in the room. The Hackathons are about connected devices, but with the ‘recommended’ and frequently sponsored hardware distributed to the teams such as Intel Galileo, Raspberry Pi, etc…. developers may struggle for a long time to even connect it to the cloud! Not to mention the innovation is usually hindered by a tedious environment setup which takes hours, things to learn about the specific hardware and how it can be programmed using low level languages. So many teams spent most of the time fighting with those issues and oftentimes still do not have their prototype ready and connected by the end of hackathon. Seeed Studio Sensors are priced $3 to $15 each, but you can also save by purchase them as a part of Grove Starter Kit for $39. The solution is solderless & plug and play – so anyone can actually use it fast. 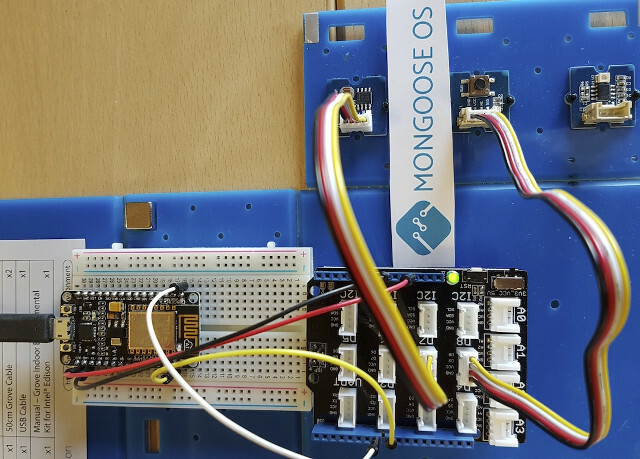 Let’s jump into the action and get ESP8266 & Seeed Light Sensor up and running with Mongoose OS in a few minutes. This example below shows how to get the hardware (sensor) data and send it to the cloud. Get your ESP8266 (e.g. NodeMCU) and Seeedstudio Light Sensor and Button ready. Now you can see how easy it was! Want to play with other Seedstudio sensors from Grove Kits? Check video tutorials for button, motion sensor, moisture sensor, UV sensor, relay, buzzer, etc… including the one below with the light sensor. Interesting…How is the memory footprint on ESP8266 with the basic 1MB flash? Will it let FW like ESPurna and ESP Easy run on top? How about OTA updates with just 1 MB flash? Any optimizations here? Mongoose OS is also a firmware, so you can’t run it alongside ESPurna or ESPeasy. Ok, as suspected. The terms FW and OS become fuzzy at times, but it would be nice to have some Mongoose v ESPurna v ESP Easy comparisons- that would be real learning. These all come with non-standard firmware, but are easily updated.